The today called city church, which is now in protestant service, was erected in the 17th century as a catholic one consecrated to Saint Nikolaus. The former church from the 11th century at the same location has become ruinous and has been disrupted in 1628. 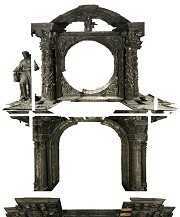 For reason of laying the cornerstone on April, 22nd of 1630 the baron of Pallandt founded a three story high altar. 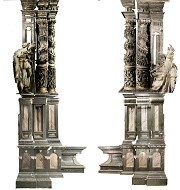 It was equipped with three paintings said being Abraham von Diepenbeeck, a pupil of Peter Paul Rubens has made them. According to the fact that in World War II the high altar has been damaged hardly it was reconstructed based on a blueprint of Leo Hugot till 1964. This condition was restored in 2009. On New Year’s Eve 2010/2011 a rocket smashed a choir window and set the altar on fire completely. 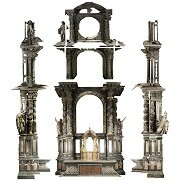 All three altar paintings have been destroyed. 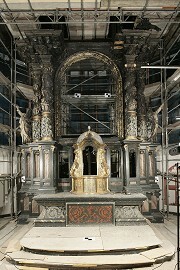 Right now it is monitored if even the choir vault has to be renovated, too. 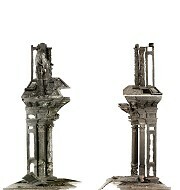 The photogrammetry is a complete documentation of the fire damage done in the scale 1:10. The work was done in corporation with Marc Witheger of baumass company, Cologne. He was the main contractor of the order. 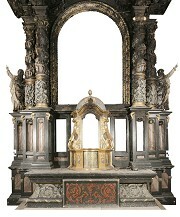 It should be indicated that this high altar is not the famous, co called Loreto-altar designed by J.J. Couven in 1755. These one has been displaced in1920 to the sacristy and was in order to this not harmed by the fire.